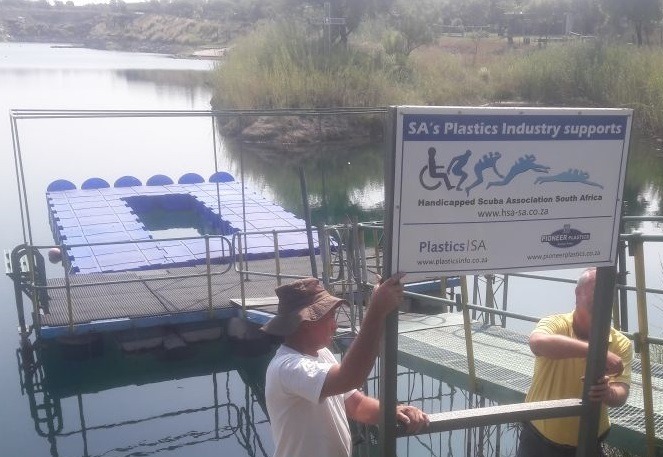 Handicapped divers are now able to enjoy the taste of freedom and the joys of diving at the Miracle Waters Dive Centre, thanks to a generous sponsorship by Pioneer Plastics and coordination by Plastics|SA. Situated just outside Brits and surrounded by the beautiful Magaliesberg mountain range, Miracle Waters is an old open cast chrome mine that has been transformed into a large, clear diving lake filled with fresh spring water. Although the resort had paved paths leading to the lake, two plastic rotational moulded jetties now makes it possible for handicapped and wheelchair bound divers to fully access and enjoy the facility. A toilet facility for disabled people, buoys and recycling stations were also generously sponsored by Pioneer Plastics. Speaking at the unveiling of the new facilities, Douw Steyn, Sustainability Director of Plastics|SA highlighted the importance of physical activity for handicapped people, and diving is one of the few sports that allow them freedom from their chairs. ‘We are very honoured to be part of this exciting initiative as part of our Clean-up and Recycle SA / Berg-2-Beach Project’. Sporting five training platforms, Miracle Waters is the perfect place for recreational divers of all levels. Steyn, an avid diver and a qualified diving instructor, used the opportunity to highlight the fact that 80% of marine litter is land based. In 2010 Jacaranda Children’s Home started the scuba diving project – Dive for Life. Dive for Life is a sanctioned PADI certified Educational facility that aims to develop the skills and self-esteem of selected learners. Through the Dive for Life project and further training this will create employment opportunities for the children. Their aim is also to qualify some of the children as Dive masters (DM) so that they can secure a future with ample job opportunities in this fast growing industry. One of the children, Lerato Mokone has been working as a DM in Malongane, Mozambique since January 2013. Plastics SA will be supporting 9 children (qualified divers) from Jakaranda Childrens Home (Pretoria) to dive with the handicapped Divers at the next Diveathon, taking place From Friday 9 March to Sunday 11 March 2018, at Miracle Waters near Brits. “We want to encourage all South Africans to help keep the country clean – from the mountains to the oceans. Water is our most precious resource and our water sources need all the protection they can get. We hope that this project will help to raise awareness amongst sportspeople using rivers and dams for recreational purposes that is vitally important to keep our environment litter free. Even litter that falls from our hands hundreds of kilometers away could end up in one of our dams and rivers and find its way to the ocean. If used properly, however, plastics are incredibly versatile and makes it possible for them to enjoy their sports,” Steyn said. Plastics|SA would like to thank our partners Pioneer Plastics, the Miracle Waters team, the Scubadoo Diving Centre’s Braam le Roux and the Handicapped Scuba Association Directors and members for making a dream come true for these divers and many more who will derive pleasure from these new additions at Miracle Waters.